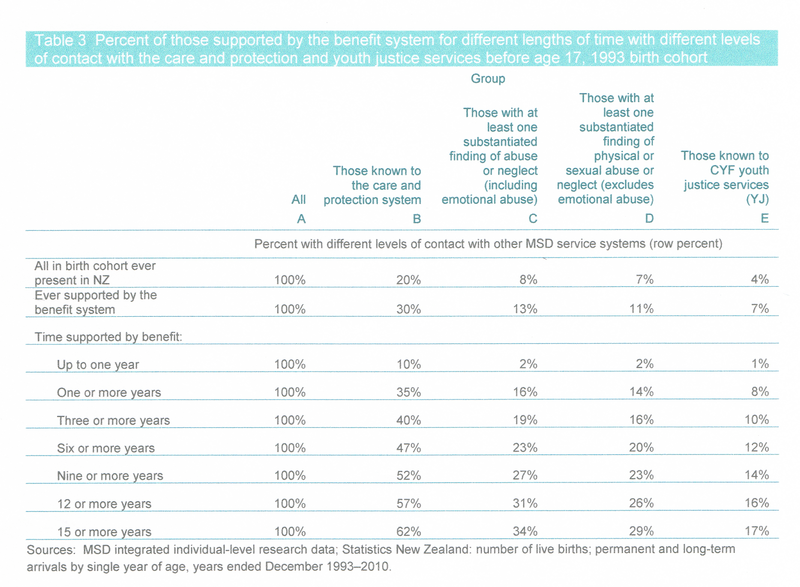 The Ministry of Social Development (MSD) has released statistical information that details the overlap between children's contact with the benefit system, and care and protection or youth justice services. Welfare commentator Lindsay Mitchell is welcoming this overdue research. "The last time MSD conducted a similar exercise was 1996 so an update was well overdue. This time the Ministry has followed the 1993 birth cohort to age 17 to explore levels of contact. Unfortunately, the data is presented in a way that downplays the risks. The benefit cohort is only ever compared to the overall cohort as opposed to the non-benefit cohort. This produces a finding that the benefit cohort had a likelihood of contact with CYF that was, '1.5 times that for the overall cohort.' However, if the non-benefit cohort was the comparison group, the likelihood would rise to 3.4 times. When MSD examines children on a benefit for 9 or more years who have experienced a substantiated finding of abuse or neglect, they describe the risk as only three times greater than the total population cohort. Again, if this benefit cohort was compared to the non benefit group the increased likelihood rises to nearly 13 times greater." Mitchell goes on to express her disappointment that MSD then claims the association is about low income, not benefit status. "This makes a mockery of analysing the overlap data. 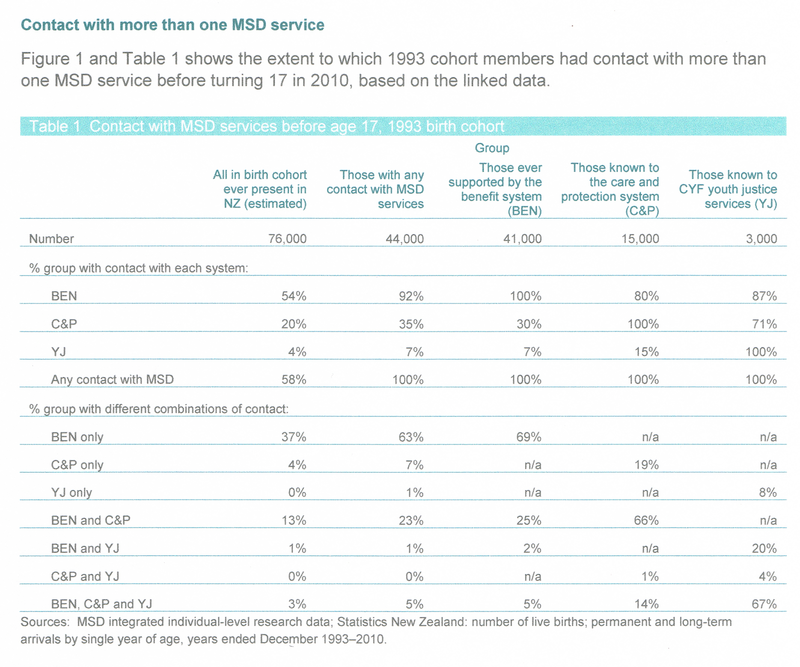 Essentially MSD has written off the correlation between benefit status and increased risk of abuse to low income." 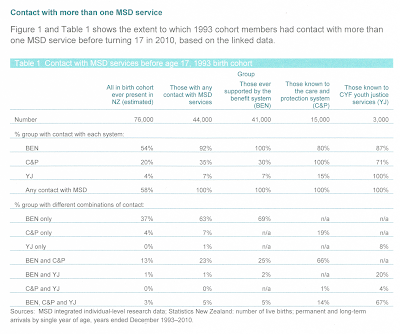 "What MSD needs to do is compare similar groups of low income children with differing sources of income ie from work or a benefit, and their respective contact with CYF. In the mean time these findings show why welfare reforms aimed at reducing long-term benefit dependency are so important for the safety and well-being of children." This summary is provided to assist in the understanding of the Court’s judgment. It does not comprise part of the reasons for that judgment. The full judgment with reasons is the only authoritative document. The full text of the judgment and reasons can be found at www.courtsofnz.govt.nz. The Court of Appeal has dismissed an appeal by the Child Poverty Action Group (CPAG) challenging part of the Working for Families package introduced in 2004. CPAG alleged that the in-work tax credit (forming part of the package) discriminated against people who receive an income-tested benefit. That was because the in-work tax credit was available only for those in full-time employment who were not receiving an income-tested benefit. This is known as the “off-benefit rule”. CPAG alleged this breached the Human Rights Act 1993 and the New Zealand Bill of Rights Act 1990 which prohibit discrimination on the grounds of employment status (which includes persons in receipt of a benefit). The Human Rights Review Tribunal and the High Court each ruled against CPAG’s challenge to the off-benefit rule. Those decisions have been upheld by the Court of Appeal. The Court of Appeal disagreed with the High Court on one aspect of the appeal but this did not affect the final outcome. The Court of Appeal found that the off-benefit rule, on its face, subjected beneficiaries to differential treatment which amounted to a material disadvantage. But, in agreement with the Human Rights Review Tribunal and the High Court, the Court of Appeal has found that the off-benefit rule is a justified limit under s 5 of the Bill of Rights on the right to be free from discrimination by reason of employment status and does not therefore breach the Bill of Rights. This is because the in-work tax credit deliberately created an earnings gap between people on a benefit and people who are working. The objective was to incentivise people into work and improve incomes for families with children. CPAG accepted this objective was important enough to justify limiting the right to freedom from discrimination but argued that the off-benefit rule was disproportionate to the objectives to be achieved. The Court of Appeal has held that the discriminatory impact of the off-benefit rule is not out of proportion to the goal of incentivising people into work, and the evidence established that it only impairs the right to be free from discrimination to the minimum extent necessary to achieve the objective. I've hesitated to label a new Ministry of Social Development factsheet a "cover-up" but having chewed over it for a few days I've decided that's exactly what it is. 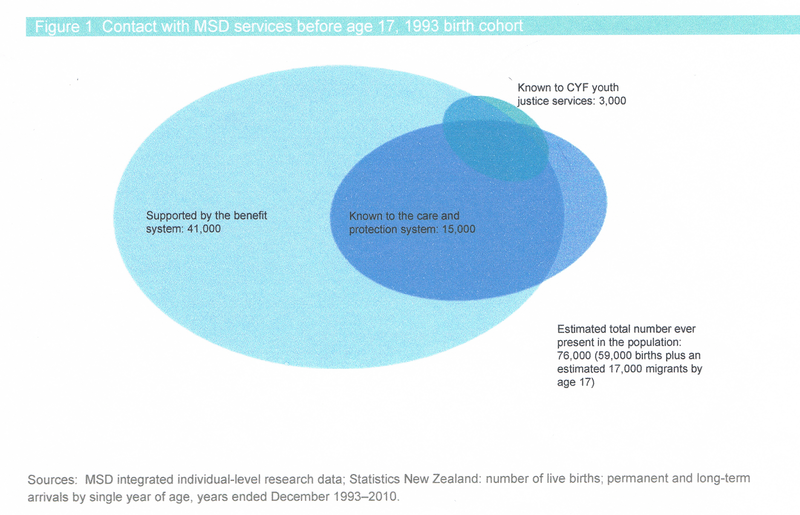 For the first time MSD has examined a "birth cohort ever present in New Zealand" and the overlapping contact with the benefit system, care and protection or youth justice services in the years to age 17. They used 1993. 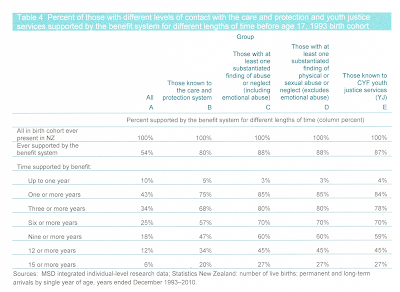 "While most supported by the benefit system in childhood had no contact with care and protection services, as a population group their likelihood of contact was 1.5 times that for the cohort overall." If you think that seems low there's a reason. Throughout the factsheet the benefit group is compared to the total cohort (which includes the benefit group). Why not compare the benefit group to the non-benefit group? Maybe because the result doesn't look so good. Children who appeared in the benefit system were 3.4 times more likely to have contact with C&P than non-beneficiary children. Nowhere in the factsheet does this likelihood appear. Being known to C&P doesn't necessarily mean a child has been abused or neglected. There is however also data available on the incidence of substantiated findings. The paper says "looking at the estimated 18 percent of the cohort who spent at least nine years of their first 17 years supported by the benefit system...27 percent had substantiated findings of abuse or neglect (a rate more than three times that for the overall cohort...)"
We know from the previous table that 27 percent of the 9+ years benefit group had at least one substantiated finding of abuse or neglect. The 9+ group represents 18 percent (table above) of the total cohort of 76,000 or 13,680. So 3,694 of them had a finding. 3,694 is 60 percent of the total children with a finding. Total children with a finding must therefore be 6,157. Children who spend 9 or more years in the benefit system are almost 13 times more likely to experience a substantiated finding of abuse or neglect than children never on a benefit. That's more meaningful than a likelihood, "more than 3 times that for the overall cohort." "The findings are consistent with associations between low income and measures of child maltreatment found both across and within countries. They do not however establish that being supported by the benefit system causes a child to be more at risk of these outcomes." Right out of the CPAG handbook. It's a pretty pointless exercise then, analysing benefit and CYF overlap only to write the association off to "low income". 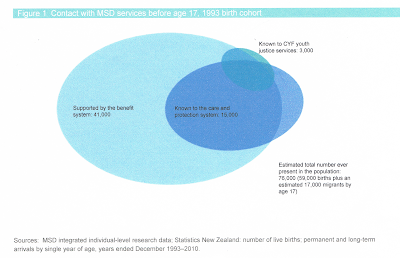 The graph below shows how many of the 1993 birth cohort who spent time on a benefit (41,000) became known to CYF and later to youth justice by age 17. For context the total birth cohort for 1993 was 76,000. I'm listening to David Cunliffe's slightly hysterical state of the nation speech as he declares his bid for the Labour leadership.
" ...watching hope die in the eyes of our young..."
Let's briefly hold that up to statistical scrutiny. Teenage birthrate going down since 2007. Youth suicide rate is dropping, albeit a very recent trend. The youth Not in Employment, Education or Training (NEET) rate down. Youth prosecuted offending is down. Child abuse substantiations are up and that can be for a myriad of reasons; more reporting, different processing, or simply more abuse. No flag bearer for National, I am interested in research and reality (and the line between those is often murky). “Researchers from The University of Auckland suggest that the findings show broad overall improvement in the health and wellbeing of young people." Drinking, drugs and other risky behaviours are on the decline according to a nationwide report on New Zealand youth launched at Parliament recently. “The Health and Wellbeing of New Zealand Secondary School Students” report published by The University of Auckland and Auckland UniServices Ltd is the third in the Youth 2000 Survey Series which provides insights into trends of adolescent experience from 2001. The 2012 survey was completed by 8,500 secondary school students and provides the country’s most comprehensive data on current adolescent concerns and behaviour. Researchers from The University of Auckland suggest that the findings show broad overall improvement in the health and wellbeing of young people. In particular, the report shows a marked reduction in tobacco, alcohol consumption, binge drinking and illegal drug use as well as lower rates of dangerous driving and small positive shifts in school life. Primary investigator from the University, Dr Terryann Clark, says that the significant overall reduction in risk-taking behaviours among adolescents is exciting and is cause for optimism. “The report indicates some strong positive emerging trends which represent huge gains for the future of New Zealand,” she says. Other results indicate negative changes in young people’s lives. For example, youth from across the social spectrum are increasingly aware of parental concerns around not having enough money for food, and increasing numbers of young people are unable to secure part-time work or access healthcare when needed. Divisions continue between the ‘haves’ and ‘have nots’ particularly in healthcare and nutrition, and in outlook for future education and training. 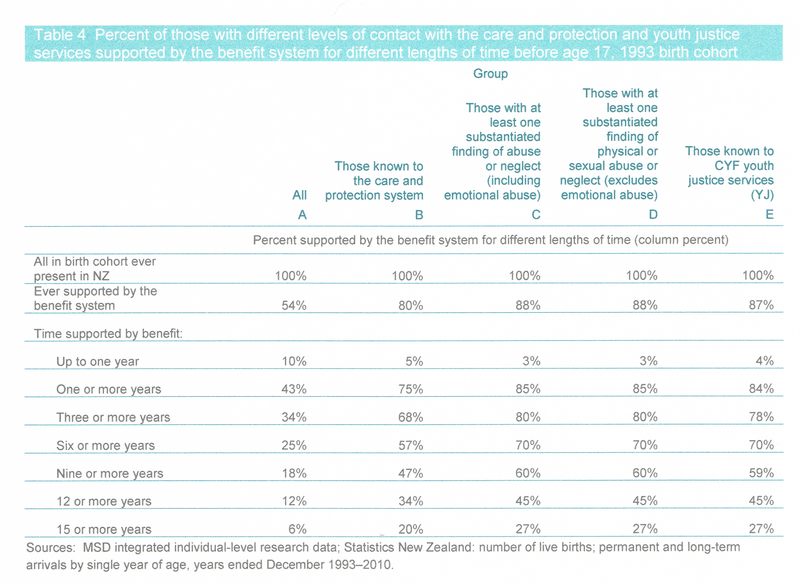 In general, the rates of young New Zealanders who are emotionally distressed, bullied, using contraception inconsistently, and/or are overweight remain static. The full report findings are now publically available at The University of Auckland Youth 12 site. 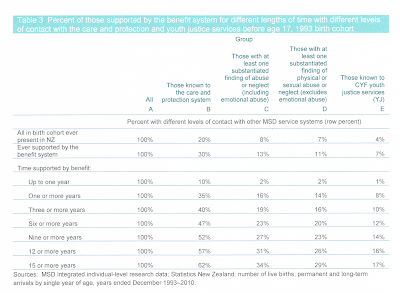 Separate reports including findings for Maori adolescents using the same survey data will be released from October 2013. Michael Laws writes about the car-boot victim who has forgiven the car-boot offender. Three months ago she was placed in the boot of her new car by her deranged, drugged boyfriend - fell out - and was then dragged 1.7 kilometres behind the car as he zoomed off...she turned up in court last week to support him as he battles lawyers and the justice system to be there for her...Yeah, but he was on drugs, Ana excuses. He'd just come out of prison and was on a bit of a booze-drugs binge. Perfectly understandable. Not his fault - it was the drugs. Give him another chance: chur, bro. When this story broke earlier this week I wasn't surprised. He'll have her tied around his little finger. He'll be laying on the deeply contrite pathos. She'll be confusing pity with love. But she is only as malleable as parole board members. They must be constantly lulled into the same sense of self-certainty about an offender's true remorse and intention to never ever re-offend. Well, maybe not self-certainty but at least somewhat confident that another chance is merited. Unfortunately the trust is too often misplaced and even as young as 26, you can bet your bottom dollar on it this guy has already had more than his fair share of second and subsequent chances.